Walden House is an organization in California dedicated to providing care, clothing, education and more to individuals with socio-economic hardships, those suffering from AIDS, the homeless, those recovering from substance abuse and others. Via Trading is honored to have been able to participate in Walden House’s donation acquisition efforts in 2010, and look forward to helping them help our community for years to come. Walden House always works to “Give Hope, Change Lives,” but it is at Christmas time that we work to transform two Walden House locations from warehouses to Winter Wonderlands. 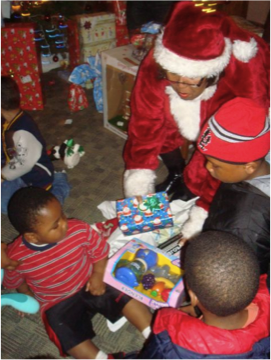 We here at Walden House set up a sort of West Coast outpost for Santa, filled with games, puzzles, books, clothing and other items so each Walden House member can pick out outfits and gifts for his or her family – ensuring that everyone will have something special for the holidays. It is part of a concentrated effort to show our clients the power of community, family and caring through events like this and others, not just in December, but throughout the year. One group of clients credited Walden House for giving “5 second chances” in their rendition of the “12 Days of Christmas,” during our Christmas dinner this year. Although the line got plenty of laughs, that is exactly what Walden House does – give people a second chance, no matter how many they need. Walden House sees the value in people until they can finally see the value in themselves, and we want to thank you for being a part of that effort. Everyone loves picking out presents! “The shopping is very important it’s a great way for me to come and get something’s I would not be able to afford, and a way for me to shop for clothes and feel comfortable about who I am. … I like the dinner it’s nice to see the staff treat us like equals,” said one client. However, sometimes the best gift isn’t something that can be bought. “Walden House saved my life and helped me see that I was on the wrong path. Today I have my children back and whenever anything goes wrong my first reaction is not to snap, and go into self defense mode,” he added. We served over 2,000 individuals and families this year! Amid tough economic times our partners still pulled together to bring this wonderful, positive experience to our clients through their donations. Thanks to Via Trading and other community donors for giving hope and changing lives with us this year, and hopefully many more to come. We couldn’t have done it without you.